Media intelligence company Isentia can now call itself a profitable company again after swinging back into the black during the last financial year. Isentia posted a net profit after tax (NPAT) of $1.3 million in the 12 months to 30 June 2018, compared to a $13.5 million loss in FY17. However, the company suffered a 12 per cent drop in revenue during the last fiscal year to $137.1 million, primarily due to its Australian and New Zealand operations, which experienced a 14 per cent fall. 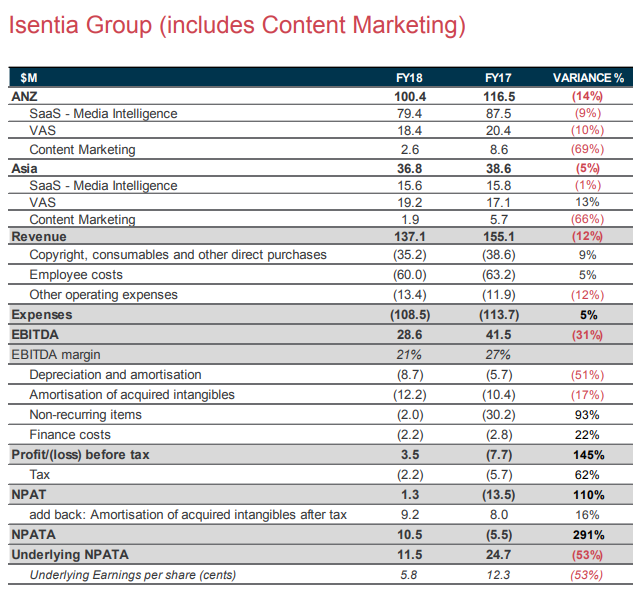 Isentia said its revenue was affected by “structural headwinds as traditional media volumes continued to fall, as well as an increasingly competitive landscape that led to higher customer churn and price erosion”. The company’s earnings before interest, tax, depreciation and amortisation (EBITDA) was down 31 per cent to $28.6 million in FY18. Isentia’s exit from its content marketing business, King Content, resulted in an EBITDA loss of $4.5 million. The company has decided not to pay a final dividend to conserve cash and provide greater investment flexibility for future growth, with priorities including product development and debt reduction. Isentia chairman Doug Snedden said FY18 has been an important year for the company as it puts in place a restructuring agenda. “Despite the recent challenges, we have an incredible franchise across the Asia-Pacific region which we are leveraging to address the shifting market realities,” he said. Incoming CEO and managing director Ed Harrison said: “I look forward to contributing to the next stage of Isentia’s journey as we adapt to an evolving marketplace. “Isentia has a strong brand, premium products and an enviable customer base, and these factors are a great starting point for transformation. Harrison said the company is focused on a number of strategic initiatives that will enable it to respond quickly to market changes and prepare for a long-term transformation that will drive future performance. These include restructuring sales and account management teams, delivering annualised gross cost savings of almost $11 million by FY20, commencing proceedings in the Copyright Tribunal to obtain an industry-based licensing agreement. Furthermore, Isentia plans to roll out its Mediaportal across Asia so that the platform is available for the first time in all markets, and wants to strengthen product development and innovation to meet market demand for differentiated customer services.